Thai Yoga Massage is a beautiful and powerful combination of massage, acupressure, stretching, twisting, energy work and meditation, all rolled into one experience. Thai Yoga Massage aims at stimulating the flow of energies within the body, to achieve a state of harmony and balance for optimum health. In a Thai Yoga Massage session, yoga postures are used with gentle stretching and pressure to open the energy lines. The therapist applies pressure to marma points (a juncture on the body where two or more types of tissue meet, such as muscles, veins, ligaments, bones or joints) along the energy meridians, using her hands, feet and elbows. Together these actions result in a comprehensive, full body treatment that relieves muscular tension, improves circulation, boosts the immune system and balances the body energetically. Most clients leave a Thai Yoga Massage session feeling relaxed and invigorated; stretched and soothed. The beauty of Thai Yoga Massage is how balanced you feel after the session. When we connect with our bodies, minds and spirits through these ancient healing arts we’re reminded that good health, vitality and joy are our birthrights! A Thai Yoga session is done on a floor with the recipient fully dressed in comfortable clothing. No oil or cream is used. If you are ready to stretch the layers of your body and soul, contact Kaya Wellness & Yoga today! Melissa Walker, LMT offers Thai Massage, Swedish, Deep Tissue, and Reflexology at Kaya Wellness & Yoga in Rehoboth Beach, DE. Melissa began her journey into the healing arts at a young age. She was always fascinated with alternative therapies and medicines that treated the person as a whole rather than treating just the “symptoms”. Melissa soon discovered massage and the ongoing list of benefits that came from it. She knew that was a path she wanted to take. In 2003 she graduated from a 500 hour program at the National Massage Therapy Institute. Continuing her journey she was privileged to learn the ancient Vedic art of Thai yoga massage which brings together her two loves, massage and yoga. Melissa approaches massage with a healing intention and believes that As thoughts and feelings are completely intertwined in the fabric of the body, Massage sometimes initiate the release of emotions and can clear unresolved feelings while releasing muscular tension. 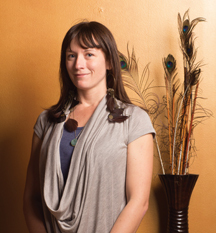 Melissa offers integrative massage and Thai yoga massage tailoring each session to meet the needs of her clients.